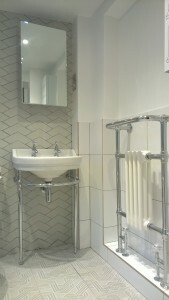 We have just completed a full bathroom remodel project in Clapham. The case looked hopeless. What could we do with this small damp bathroom in a tiny side return? Three weeks later it is transformed into a bathroom that cheers your morning and makes a relaxing evening soak a pleasure. 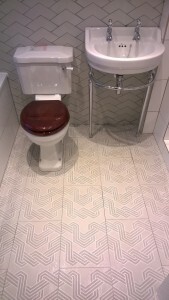 The chevron tiling on the rear wall, using beautiful hand made tiles from Smoke and Fire, are a really eye catching feature. They work well with the ‘funkycarpet’ floor tiles from Worlds End Tiles. The rest of the room is half wall tiled in a white, large format, industrial tile. This draws the eye to the chevron tiling on the feature wall and the stunning Burlington fittings. The basin is an Edwardian round 56cm basin and basin stand from Burlington Bathrooms combined with a Regal close-coupled pan with slimline lever cistern. 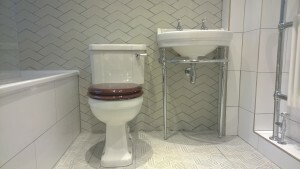 The Burlington product range against the backdrop of the chevron tiling give this bathroom remodel a traditional feel. The Burlington range is a great combination of traditional style and modern technology. The lever flush is actually a dual control. If you push it upwards it releases a small flush and downwards for the full. The traditional style Burlington towel heaters are more practical than the basic design of modern ones. Rather than trying to stuff towels into the small gaps between bars these towel heaters have a more user friendly rail. To add to the warmth of this previously cold, damp room we installed warm-up underfloor heating. This is a great feature in a ground floor bathroom with a concrete sub-floor. Without it tiles laid directly on to the concrete can be icy cold in the morning. For more pictures of this stunning bathroom remodel visit my gallery on London Bathrooms website.